Earlier this year earthquakes in Nepal leveled thousands of buildings, killed upward of 8,500 people and injured hundreds of thousands more. The magnitude 7.8 and 7.3 temblors also cracked or damaged several hydropower projects, underscoring another imminent danger: dam bursts. More than 600 large dams have been built or are in some stage of construction or planning in the geologically active Himalayan Mountains, but many are probably not designed to withstand the worst earthquakes that could hit the region, according to a number of seismologists and civil engineers. Should any of the structures fail, reservoirs as large as lakes could empty onto downstream towns and cities. A collapse of Tehri Dam in the central Himalayas, which sits above a fault, would, for instance, release a wall of water about 200 meters high, slamming through two towns. In total, the flooding would affect six urban centers with a combined population of two million. More powerful earthquakes are indeed likely to strike the Himalayas in coming decades, seismology models show. The Indian subcontinent is pushing under the Tibetan Plateau at roughly 1.8 meters per century, but it regularly gets stuck; when the obstruction gives way, a section of the Tibetan plate lurches a few meters southward and releases the pent-up energy in an earthquake. The Nepal earthquakes also destabilized the region to the west, notes Laurent Bollinger, a seismologist at the French Alternative Energies and Atomic Energy Commission. Destabilization makes a great earthquake, which is defined as having a magnitude of 8.0 or higher, more likely to occur sooner rather than later. Other studies indicate that the earthquakes released only a mere fraction of the stress of this fault line, which is expected to readjust with quakes of equal or higher magnitude. “Whether they'll break now, in an 8 or wait another 200 years and then give way in an 8.7, one cannot say,” says seismologist Vinod K. Gaur of the CSIR Fourth Paradigm Institute in Bangalore. Such seismically active regions are exactly where hundreds of dams 15 meters or higher are either under construction or being planned, most of them to supply hydropower to India or China. Any dam being built during this government-funded boom, as well as those already completed, must be able to withstand the strong ground shaking of an extreme earthquake, says Martin Wieland of the International Commission on Large Dams, a group of engineers that makes recommendations for structural standards. Although every nation has its own regulations, India and China are secretive about their dam designs when it comes to public scrutiny. Independent engineers rarely are allowed to evaluate the robustness of the structures, and when they are, the results can be unsettling. For example, Probe International, a Canadian environmental research organization, reports that designers for China's Three Gorges Dam used “the most optimistic interpretation possible” of seismic shaking. Similarly Tehri Dam never underwent realistic simulations, asserts Gaur, who served on its oversight committee, along with civil engineer R. N. Iyengar, formerly of the Indian Institute of Science in Bangalore. Government-affiliated scientists and engineers claim that Tehri Dam can survive an 8.5 shock, but outside experts are not so sanguine. Any of hundreds of dams could be in danger of bursting when the next big one hits. If that were to happen during monsoon season, when the dams are full, the consequences could be catastrophic. Local corruption can complicate matters, enabling contractors to get away with using substandard materials or deviating from mandated parameters. A 2011 study published in Nature found that an overwhelming majority of deaths from building collapse in earthquakes occur in corrupt countries. What is more, Transparency International, a nongovernmental organization that highlights corruption, identifies public construction works as one of the world's most bribery-prone industries—with dams being of special concern. Scandals involving dam projects have roiled both India and China, to the extent that the former Chinese premier, Zhu Rongji, coined the evocative term “tofu construction” to describe a defective dike. A handful of scientists who understand the hidden dangers of the Himalayas have taken the lead in arguing for realistic, undisguised assessments aimed at protecting the region's population, though only with limited success. In a case brought by environmentalists against Tehri Dam, the Supreme Court of India sided with government scientists to dismiss safety concerns. And in 2012 seismologist Roger Bilham of the University of Colorado Boulder was deported from the New Delhi airport, in part, he says, for his unwelcome prediction that the Himalayas can sustain a magnitude 9.0 earthquake. Bilham contends that the Indian government has since discouraged foreign collaborations in seismology. For now, all concerned parties can do is call attention to the problem. “Sunshine is the best disinfectant,” says Peter Bosshard of International Rivers in Berkeley, Calif. “Without public scrutiny, it is much easier to get away with cutting corners.” Given the stakes, more than sunshine will be necessary: the next great earthquake in the area may well result in a man-made tsunami. 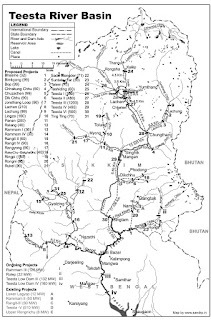 This article was originally published with the title "The Impending Dam Disaster in the Himalayan Mountains."